A rift among organizers of Calaveras County's famous frog jumping contest that led to dueling competitions Sunday did not keep away thousands of frog wranglers inspired by Mark Twain's tall tale. About 4,000 contestants entered the Calaveras County Fair's annual Jumping Frog Jubilee this year, twice as many as last year, according to the event's organizers. "We ran out of entry forms and had to get more because the response has been so big," said marketing director Laurie Giannini. "There's that saying, any publicity is good publicity." The jumping frogs of Calaveras County drew extra attention this year after a quarrel with the fair's organizers led the club that has traditionally overseen the competition to start its own jump. The Angels Camp Boosters, which had judged the jubilee since its inception in 1928, scheduled its own jumping frog contest for the same weekend to compete with the fair's. "Both sides are doing everything they can to make sure that this year's frog jumps are done well and have a lot of pizazz to them," said Anne Forrest, president of the Angels Camp Business Association. Low attendance at last year's event was blamed in part on rainy weather, a far cry from Sunday's sunny skies. The annual event is inspired by "The Celebrated Jumping Frog of Calaveras County," Mark Twain's tale of a frog-jumping contest that is weighted in one gambler's favor when he secretly fills his opponent's frog with buckshot. 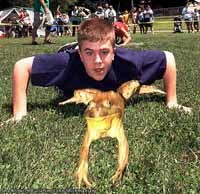 Winning frog owners get a $750 (euro556.50) prize or $5,000 (euro3,710) if their frog breaks the 1986 record of 21 feet, 5 3/4 inches (6.54 meters) set by Rosie the Ribeter.